Sometimes we forget that it's the music that really matters. 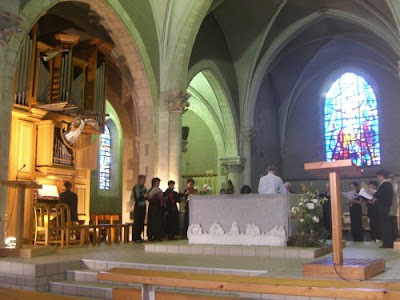 To remind us here is a photo I took recently in L'Eglise Saint-Pierre in Commequiers in south-western France. The Ensemble Vocal de la Cathédrale de Nantes directed by Louis-Marie Burgevin with organist Nicolas Daviaud (check out details of that beautiful new French classical style organ here) were performing the exquisitely balanced programme below. But I was in deepest rural France for a specific reason, find out why later this week. Now read about a Bach chorale's secret French connection. Elgar's The Music Makers is not his finest work. It sets for contralto, chorus and orchestra the poem by Arthur O'Shaughessy (1844-1881), a friend of Dante Gabriel Rossetti who worked in the British Museum as a zoologist. O'Shaughessy's poem is a typically Victorian mixture of heroic optmism and nostalgia that you would think only an English gentleman could set to music. But the Hungarian Kodály also composed a setting of the poem. It was written in 1964 for chorus and orchestra and was, I believe, to a commission from Merton College Choir, Oxford.